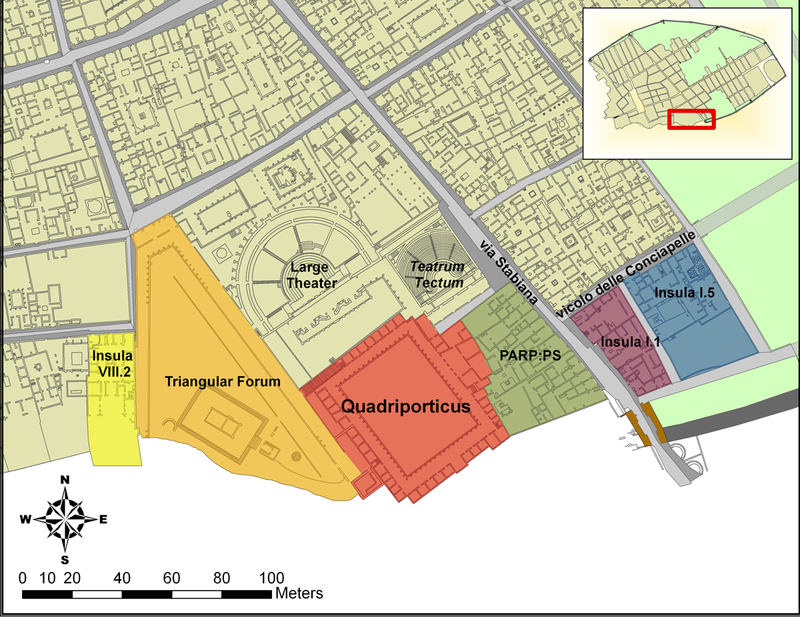 The Pompeii Quadriporticus Project (PQP) is a new archaeological and architectural research project that is designed to conduct the definitive study of one of the largest and most important monumental buildings in the World Heritage site of Pompeii, Italy. Combining cutting edge scanning technologies with an exhaustive examination of the physical fabric of the poorly-understood Quadriporticus, and incorporating the results from the excavated remains of its easternmost borders (Pompeii Archaeological Research Project: Porta Stabia), the PQP is putting this long ignored monument back into its archictural and urban contexts. The PQP is co-directed by Dr. Eric Poehler (University of Massachusetts-Amherst) and Dr. Steven Ellis (University of Cincinnati), who is also the director of PQP's sister project, the Pompeii Archaeological Research Project: Porta Stabia. Our work is generously funded by a UMass Amherst Faculty Reseach Grant / Healey Endowment Grant, the UMass Department of Classics, by the Louise Taft Semple Fund of the Department of Classics at the University of Cincinnati and by a gift from Cardinal Intellectual Property.